Residents’ four-year-old struggle to stop a Royal Farms gas station – proposed across from the Hamilton branch of the Pratt Library in Northeast Baltimore – was dealt a blow yesterday when Circuit Court Judge Alfred Nance denied their appeal of an October Zoning Board approval. The project, at the intersection of Harford Road and Glenmore Avenue, is in a B-3 zone that permits a convenience store, but that requires a “conditional use” for the construction of gas pumps. The Zoning Board had said last October that it would grant the conditional use because it found no additional problems created by the gas pump use beyond those to be created by a convenience store, which is permitted in that location. “The Board is not convinced that the addition of the gas station portion of the proposed use would significantly increase these risks to public health, security, or general welfare any more than those risks already posed by what could be a large, bright, traffic-riddled, permitted ‘as of right’ convenience store,” the board had concluded in its 4-1 October decision. Appearing on behalf of Two Farms Inc., the chain’s corporate parent, Andrew H. Baida argued that the Schultz case did not apply and that the Zoning Board had not found any additional adverse effect from the gas pumps. 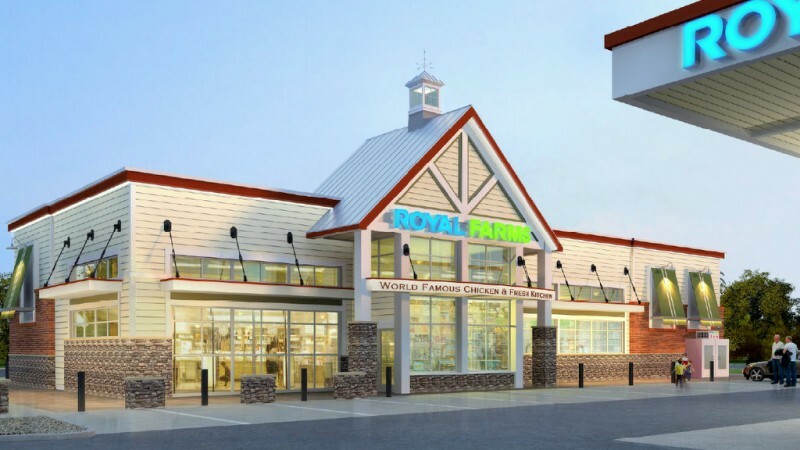 Denying rights to Royal Farms would be “arbitrary, capricious and illegal,” Baida said. After listening to arguments for a little over an hour, Nance rejected Murphy’s argument and ruled in favor of Two Farms. “This court disagrees with Mr. Murphy’s reading of Schultz based on the facts of this case,” Nance said. Nance said he knows the intersection well and even acknowledged the underlying concern – “How many gas stations is too many?” – but said his authority in reviewing zoning’s decision was narrow. About a dozen of the opponents attending the midday hearing expressed frustration with the fact that with so much opposition – 10 area community groups oppose the Royal Farms proposal and none favor it – for such a long time (here is a story from 2013), the project advanced again. “Why even ask us? Why not just say, ‘You can do whatever you want?’ ” said Kristen Hernandez, owner of the Hamilton Bakery and president of the Hamilton Business Association. Residents have argued that the proposed eight-pump gas station would cause a traffic hazard at the unusual five-way intersection where it is proposed. Before the Zoning Board and in other hearings, as well as in letters and emails to public officials, they have said a suburban-style 24-hour gas station and convenience store is not appropriate for a residential community with elementary schools, small businesses, a library and lots of pedestrian use. ” ‘Baltimore City: No small business owners here!’ That should be our new tagline,” said Regina Lansinger, director of Hamilton Lauraville Main Street outside the courtroom. “To have something like this that is in direct competition to the small business corridor, the efforts, the progress that we are making toward revitalization – this is just a smackdown,” she said bitterly. The Zoning Board’s decision came with conditions, noted Sandra R. Gutman of the city Law Department, reading them aloud in court. Royal Farms would agree to donate a portion of the property to the city for a realignment of the intersection to make it safer and to relocate the traffic signal. The installation of lighting and landscaping would minimize the gas station’s impact on the adjacent residents, she said. “At least we can hold them to all these conditions,” Lauraville resident Jody Landers said afterwards. Others said that opponents need to determine whether they want to take the step of appealing the case yet again. “I think we have come together as a group in the next few days and decide what we want to do,” said Glenham-Belhar Association president Roop Vijayan.